I should be posting more, I really should. Poor blog. I’ve ignored it for long periods. This week I was facilitating an introductory Captivate class. One participant asked me what the difference was with using the Drop-Down selector as opposed to using the icons for making textual elements Bold, Italics or Underlined. Here you can see the panel in Captivate. And until I had been asked this question, I have to admit that I was blissfully ignorant. I had never given any thought to the “style” drop-down. At least not until this point. So I pinged some of my associates to ask if they had better insights. The responses I got back were a bit less than conclusive. One response simply said that “this worked like it does in Microsoft Word” and another talked about the three generic T buttons being like “faux” formatting. What was interesting to me was that of all the folks I asked, there seemed to be no definitive answer. So I went digging for more in order to offer a reasonably coherent answer to the class participant that asked. So keying off my first response, I opened Microsoft Word. And I was stymied at first because I have Word 2010. It doesn’t seem to offer dialogs like older versions did. It has the infamous “Ribbon”. But fortunately, if you look in the lower right corner of the section and click, voila! A dialog! Notice that it has a drop-down labeled “Font style”. And that provides the clue we need. See, when someone designs a font for our operating system, they design all the different characters that compose the font. But not only may they design the characters, they may create different sets of characters. And therein lies the key to explaining this. 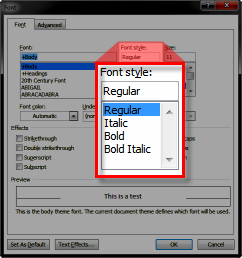 What the Font style drop-down does is to allow us to select the set of characters within the installed font. To contrast this, I headed for the Fonts area of Windows. 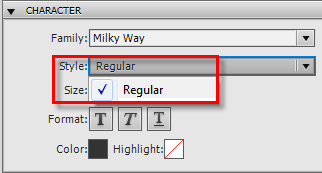 I looked at a font named Milky Way that I had installed. When double clicking the font, Windows only opens a single window to present the single set of fonts. 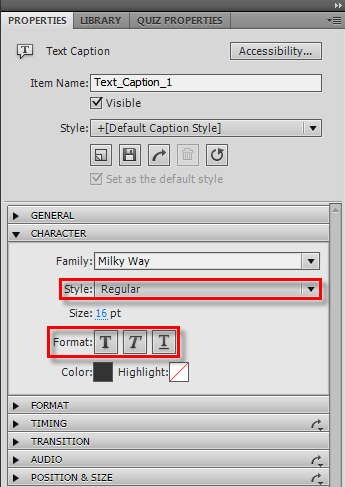 And likewise, if I select this font in Captivate, the drop-down only lists a single item. So the bottom line on this appears to be that if you select from the drop-down, you are choosing a specific character set inside the font. And that will apply to all the text in the element you have selected. And if you make a selection and use the generic letter Ts (I hate the generic representation and long for the good old and more familiar B I and U) you are advising Captivate to apply its own formatting to make the selected text appear as desired. And as my class participants stated, you can get some bizarre behavior by mixing the two elements. This entry was posted on August 5, 2011 at 12:44 PM and is filed under Captivate, General Musings, Software Tip, Technical Writing. You can follow any responses to this entry through the RSS 2.0 feed. You can leave a response, or trackback from your own site. “Faux” formatting is quite accurate. Typeface designers can and do create a design of letters and characters which often include complete sets with variations common to typeface design. That means that ss a part of the process, typeface designers design and create a set of emphasized versions (black, bold, semibold, medium), the oblique or italics version (they are different by design), and several other variations that are sets within the typeface family (like ITC Franklin Gothic). So one would buy and use (or typeset) the designed semibold version of the typeface to emphasize elements of the typographic work at hand. With the advent of the ability to digitally manipulate characters, changing characters in a typeface family to appear thicker or darker became “making the characters bold” and as such applies a thickening or darkening effect on otherwise un-emphasized typeface characters. So, if one finds “Arial Black” and compares it to the bold effect applied to “Arial,” one will see differences (as well they should). Purists will find and use the version of the font that was designed to be bolder or darker and will not apply a computer generated effect to bolden or darken the characters. Afterall, the typeface artisan never intended someone to take the typeface characters so carefully and so arduously designed and make them darker by thickening the shape. You provide the best advice at the end of your blog: don’t mix the two. If you do, the end product may appear differently than you intended. Due to the temporal nature of the fruits of our labors most of us capriciously use “applied emphasis” in lieu of typefaces designed to be bolder and hence emphasized (in relative terms). Not so much a condemnation of the lack of permanence in our work rather it is a resignation to the vagaries of contemporary production and the painful realization that the products we produce will rarely last longer than a few milli-centuries. @Chromehunger Thanks for confirming my explanation to Rick about ‘faux’ formatting, that I tried to keep as simple as possible. For a good designed font the real thing is a lot to be preferred to those ‘faux’ attributes. The difference between ‘e’ in Myriad Pro when italicized and bolded with the faux attributes compared with the real Italic bold font is very clear. Watch the changing width of the lines and the way the curves are made. I did not refer to Word, because, until I miss something, Word never offers all the available real fonts in a family as does InDesign and… Captivate. Just an example for Myriad Pro as well: where do you find the Semibold categories in Word? As for the bit about Word not offering all the available fonts? I just looked at the dialog in Word 2010 and it seems to behave similar to Captivate. By that, I mean that as I arrow through the list and observe the Font Style dialog, I do see that some fonts list Semibold. Granted, I noticed Myriad Pro didn’t, but others did. So I’m unsure as to why that would be. Then again, I’ve only recently begun to make sense of this murky topic! Rick, if I’m not sure about something, be sure that I will tell so. I did know the difference between ‘faux’ and real attributes quite well, typography is one of the subjects in my InDesign course. But as you know I do not teach in English, and even the application in this case was in Dutch. So I’m unsure about the correct words. 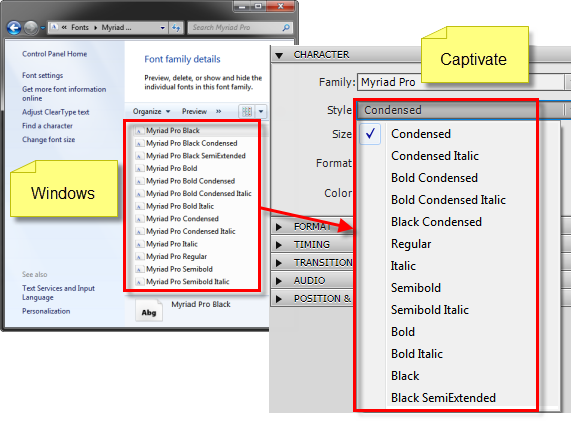 Not all fonts (Myriad Pro is an Open Type font) show all the available categories in the family in Word, but they do in Captivate and InDesign. Will not start to explain difference between the types of fonts, is bit off topic.